Whatsapp Mobile messenger is a cross-platform messaging app for mobile OS like Android, Blackberry, Symbian and quite a few S40 platforms. With Whatsapp mobile messenger you can send and receive messages with friends from anywhere in the world irrespective of their phone’s OS or model or network code. Whatsapp simply use same data plan your phone uses for internet, email etc and thus does not attract any other cost for you, you can even exchange images, videos and even audio messages. All these are done via mobile phones. Imagine you don’t have your phone close to you on the instant and you want to send and receive messages with your friends or you don’t have airtime or data plan on your phone? Yet you have your computer with you and a very fast internet network. Now that is the essence of this post to teach you how you can easily use Whatsapp on your computer. It’s been known for long that there are mobile phone operating system emulators like Java emulators, Symbian emulators and even Android emulators. But for the purpose of this post, I will be concentrating on Android emulators. There are two Android emulators I actually like – Youwave and Bluestacks. While Bluestacks will be best for those that don’t have $14.99 to buy the activation key for Youwave because of its one year free trial period, Youwave is a very great tool to simulate Android apps on a PC. 1. Download any of the Android emulator of your choice above. 4. Visit Whatsapp’s website www.whatsapp.com and download the Android version of Whatsapp (Whatsapp.apk) from the site through the Android Appstore. 6. Register using a new mobile number that has never been registered with Whatsapp and verify your registration.You will not be able to verify via SMS so wait for call verification. I hope you find this post interesting. Now you can use Whatsapp on your computer. If you have any contributions to make, please use the comment box below and tell me what you think about this blog post, feel free to share this post with your friends. Remember to Subscribe to NetMediaBlog Feeds by Email. I read your post on How to email chat history in Whatsapp.I must tell you though i couldnt send the chats to my email,(The process was easy to comprehend).I had issues with email settings on my NOKIA 5 Phone.My fiance uses a windows phone and the whatsapp version on her phone was lower. Wow!!! 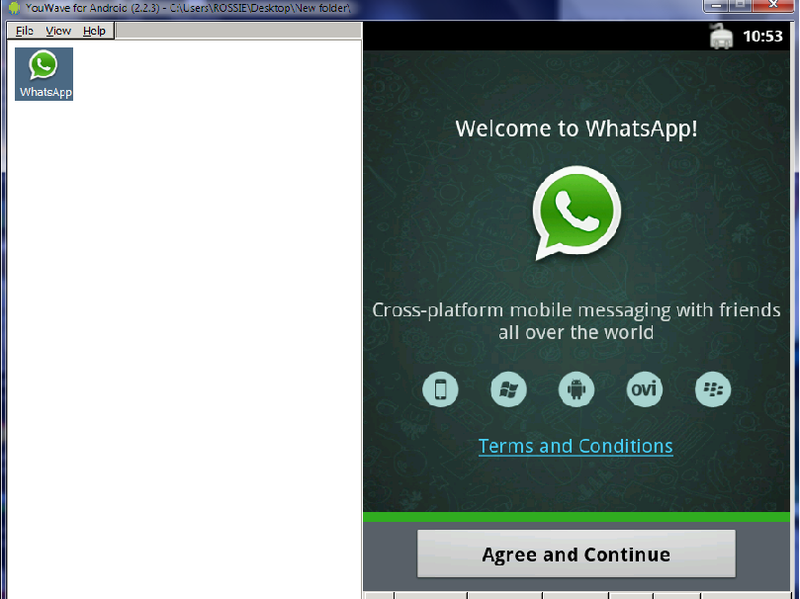 !thanks for sharing information regarding “Android emulator” its really helpful. AWESOME POST! By any chance, do you know how I could paste text into this emulator or add pictures from my computer to it? Control V does not work to paste. Thanks for your time, and this amazing post! I am using Whatsapp through Youwave on PC. I am not able to delete photos/videos from the Gallery in Whatsapp. Any help is appreciated. Simply go to the Youwave folder and search for where the whatsapp files are stored and delete from there. God will always bless u with knowledge and understanding. Great post. In fact I’m using my YouWave to play my Android games.